Explanation: Light polarization is familiar to many outdoor enthusiasts who use polarizing sunglasses to cut the glare of reflected light. These two views of comet Hale-Bopp also demonstrate the effect of polarization. At left is an "ordinary intensity image" of Hale-Bopp's coma taken April 14, while on the right a similar image made with polarizing filters represents the intensity of polarized light. 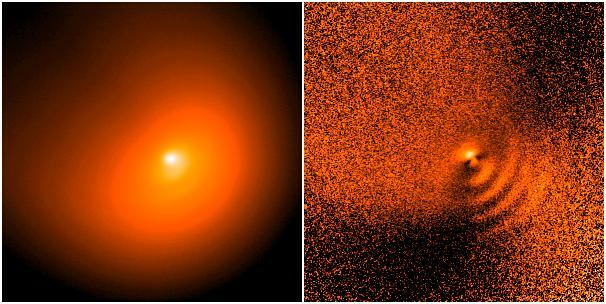 The arcs visible in the polarized view probably correspond to concentrations of ejected cometary dust that produce polarization by reflecting sunlight. Any sort of reflection - from clumps of comet dust or the surface of your favorite lake or ski slope - can polarize light by causing the light waves to vibrate in a plane defined by the reflecting surface.